Enterprises today face the major challenge of how to fully orchestrate the apps that define their business and automate the IT processes underpinning them when much of the infrastructure used to run them is outsourced to cloud providers. Some cloud service providers offer their own orchestration tools, and each on-premises tool has automation capabilities. But while we own our apps, providers are interchangeable depending on what they can offer and for what price. We should be able to switch between cloud providers and between cloud, on-premises and hybrid infrastructure as and when the business requires, with minimal effort and without losing any control. Sometimes we might want to use more than one provider at the same time, leveraging the advantages of each provider simultaneously. What is needed is an orchestration layer that remains constant while cloud services come and go; one that enterprises own along with their core apps. 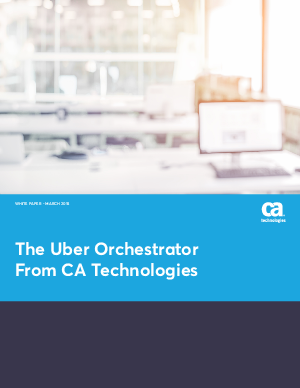 CA Technologies calls this solution Uber Orchestration. It’s a self-service manager and orchestration tool for connecting the pre-existing automation and orchestration apparatuses in your company to cloud providers.